So I had leftover foam sheets and t-shirt scraps after my impromptu Skeleton costume tutorial. What’s a girl to do, but make another costume? This costume requires a tiny bit more sewing then the skeleton costume, but no painting. Since you don’t have to wait for paint to dry, this is a fabulous and fast last minute doll costume. Can you see how easy it would be to use this formula to make a huge variety of Halloween costumes for your dolls? Change the mask to penguin : Boom. Penguin Costume. Or change the colors to red and brown and make a fox! Make a kitty! How about a dragon? The possibilities are endless. 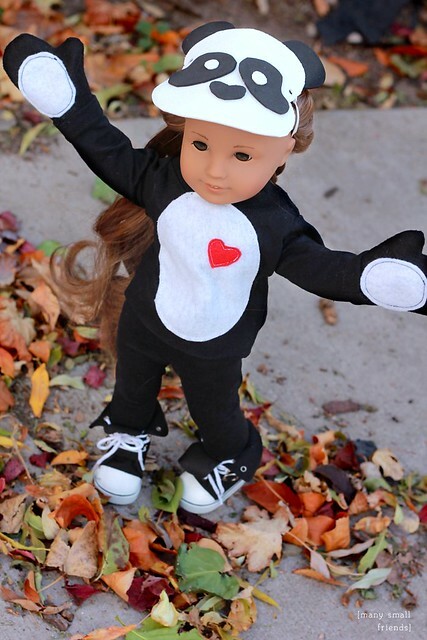 If you make a costume for your doll (even if you don’t use MSF patterns) will you post pictures on our Facebook page? I’d love to see! In addition to the black knit fabric or human-sized black t-shirt to cut up, and the black and white foam sheets, you’ll also need a few scraps of black, white, and red felt. You could probably substitute other fabrics you have on hand, but felt is so versatile and easy to work with, I always keep some on hand for dolly projects. I put together a 5 minute video tutorial on YouTube to show you how to make the Panda Costume. Kanani told me it was about time she got the starring roll in a Many Small Friends video. I think she’s a natural. A note that bears repeating from the Skeleton costume, remember that black fabrics sometimes contain a lot of dye that can stain your doll. It’s best to pre-wash your fabric or the t-shirt you cut up for this project before you start. And just to be safe, don’t leave your doll in her costume for an extended period of time or in a very hot environment (like a hot car or in a sunny window). She’ll be fine for Trick-or-Treating, but don’t leave her in her costume til the New Year! 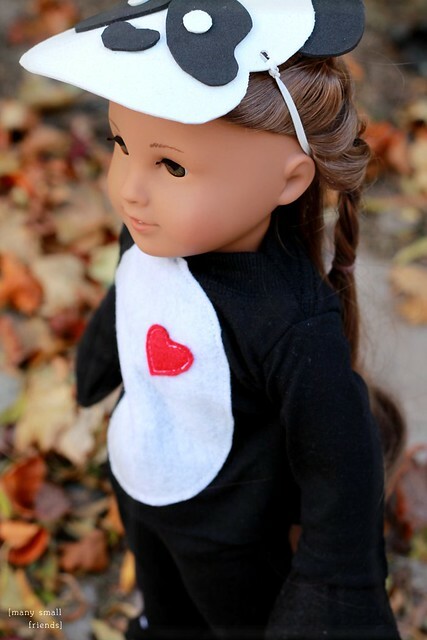 This entry was posted in Doll Sewing, Doll Video, Free Doll Patterns and Tutorials and tagged 18" Dolls, American Girl Dolls, doll costume, Doll Video, Dolly Holiday, Free Doll Pattern, Halloween, Sewing for Dolls. Thank you so much for this pattern! It is super cute! I’m sure my daughter will love it! Thank you for sharing these great patterns and tutorials. Can’t wait to get started!